I know, I know, it’s digital blasphemy to say that using Internet data is a terrible way to study social movements. What about all of those Twitter and Facebook revolutions of the Arab Spring? And Occupy Wall Street? #Ferguson and #BlackLivesMatter spread like wildfire, for God’s sake. You may think that I’m a luddite who doesn’t see the sheer statistical splendor and speed of social network diagrams or automated text analyses made from Tweets. Or, perhaps you’re thinking that old-school scholars just don’t get it: digital activism is the future, so we need to disrupt, innovate and flatten those hierarchical Marxist social movement sociologists. I’ve become obsessed with “Un village français.” No, it’s not an idyllic town in Provence. It’s a French television series set during World War II. The show follows the residents of one French town as they navigate the German occupation. 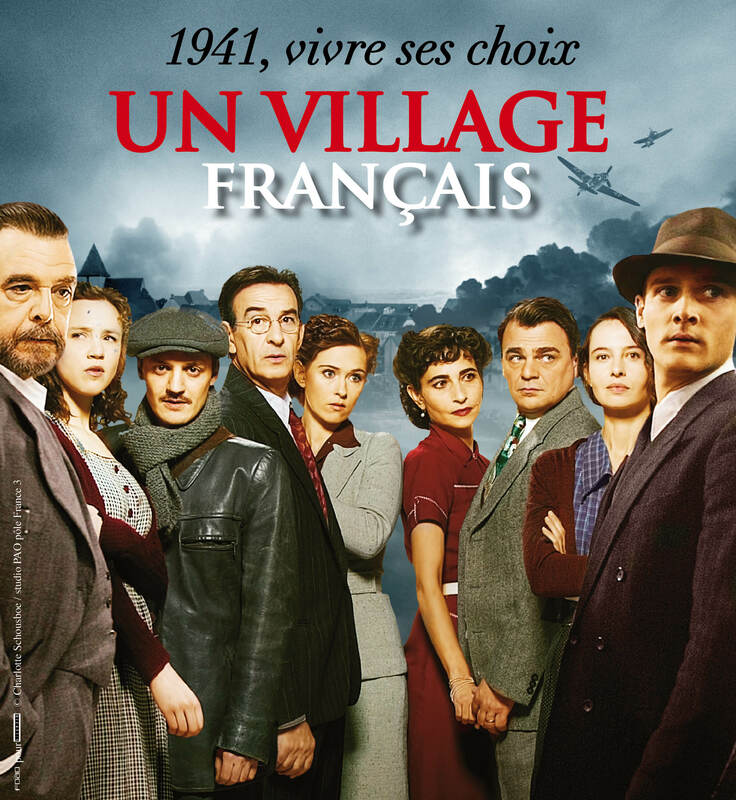 “Un village français” is a French television series set during the German occupation during World War II. I tell myself that I am already into the 6th season (thank you, Netflix) because it helps me learn the language. I have just started a Postdoctoral Research Fellowship at the Institute for Advanced Study in Toulouse, based at the Toulouse School of Economics. And I do need to brush up on my French. But admittedly, I am fascinated with the drama and romance of the TV series. But I have also realized that the show mirrors the way I approach my research on social movements, social media, and social class. It focuses not on the big heroes, or iconic giants of history, but on the average people. And rather than dwelling on extraordinary events like big battles involving thousands of troops, the shows unfolds slowly as we watch these regular people struggle with everyday circumstances. If you haven’t heard of the Moral Monday Movement, stay tuned. One year ago, on April 29, 2013, 17 people, including ministers, academics and workers, were arrested in the North Carolina legislative building in Raleigh. The 2012 general election ushered in a conservative take-over and super majority of the North Carolina General Assembly and a new Republican governor, resulting in a deluge of legislation that curtailed voting rights, refused federal Medicaid and unemployment funds, and restricted reproductive health services. A broad coalition of organizations responded with non-violent civil disobedience at the capital with weekly Moral Monday protests, which are led by the state’s chapter of the NAACP. The initial 17 arrested grew into about 1000 by the end of the summer’s legislative session, and thousands showed up for each protest. 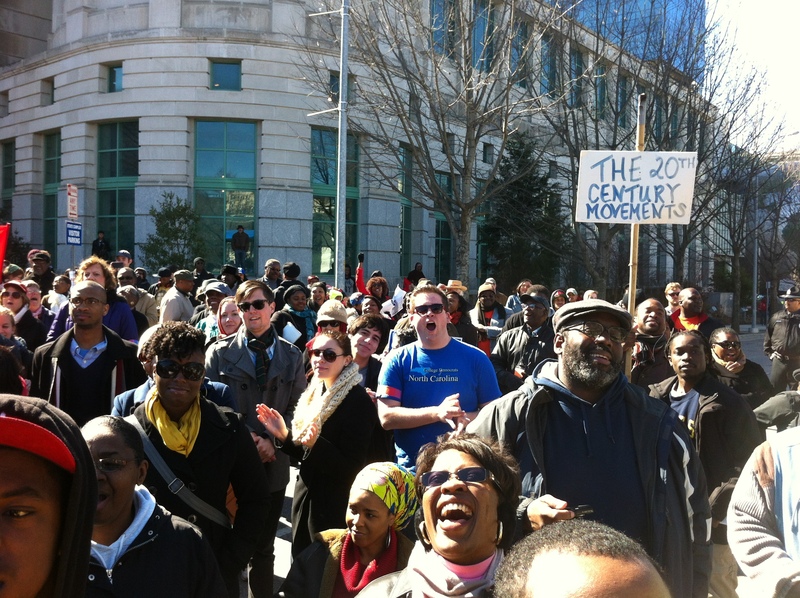 Moral Monday has not only grown and spread throughout the state to other North Carolina cities but also to other states, such as Georgia and South Carolina. 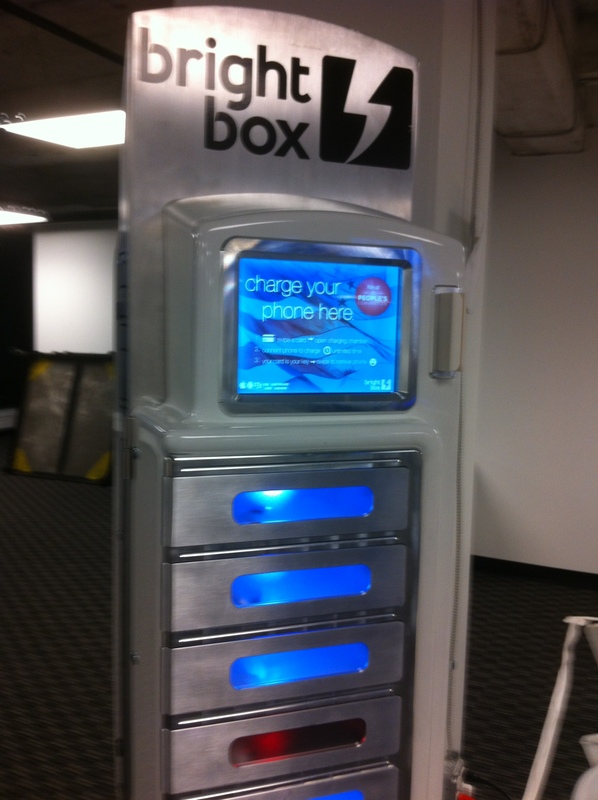 I was camping over spring break when I used my smartphone to log onto Facebook and post some photos. As I scrolled down through my feed, I noticed that a number of people had changed their profile photos to the now iconic Human Rights Campaign (HRC) logo. Having been digitally disconnected for a few days, I asked my partner what it was, and he said that it was in support of the marriage equality case being heard in front of the Supreme Court (SCOTUS). As a social media and social movement scholar, I was intrigued by all of the permutations of the image, similar to other Internet memes of social movement moments, such as that of the UC Davis pepper spraying. 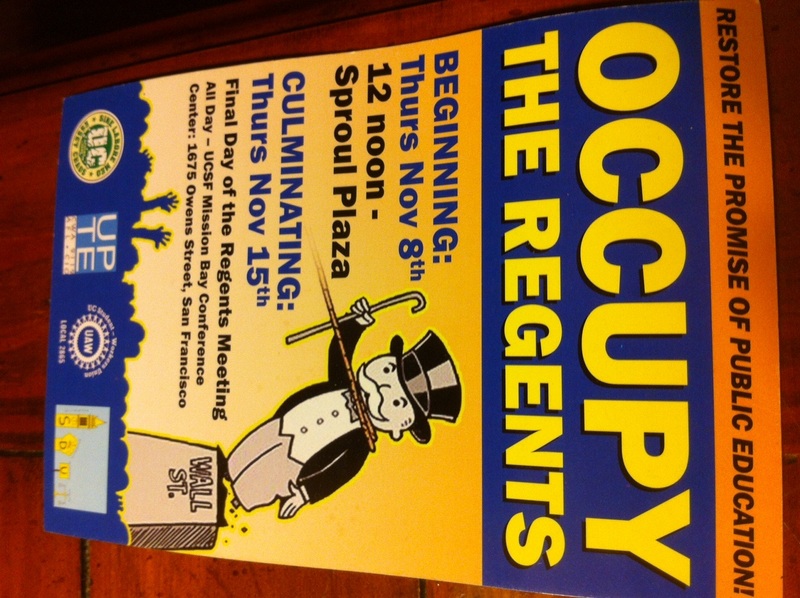 Postcard for recent Occupy the Regent actions with student and labor activists across the state of California. With all of the Monday morning quarterbacking after the election, what is often left out of the equation is the Occupy factor. Many dismissed Occupy this past year as ineffective, disorganized and, well, dead. Many asked why Occupy wasn’t working within existing political structures to effect change. But like many social movements before it, working “within the system” can mean something broader than running candidates or lobbying legislators. Countless news stories tout how the Internet has transformed this election, but how has political media coverage shifted in the digital age? To help understand this question, it’s useful to recall one of the birthplaces of political movements and Internet reporting. 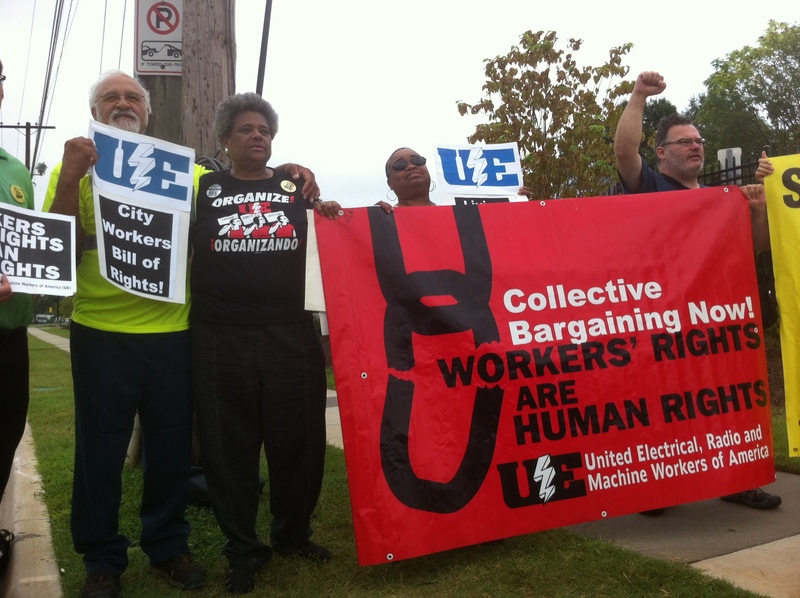 While the Obama sign waving and t-shirt wearing union members at the Democratic National Convention (DNC) creates a picture of a giant love-fest between unions and the Democratic Party, underneath this façade is a burgeoning labor movement in the South that is shaking the foundation of this relationship.